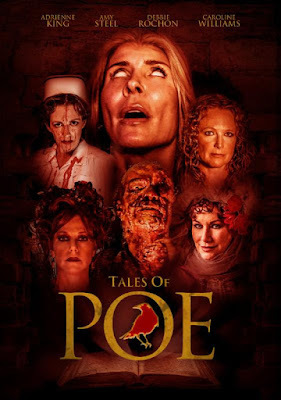 Wild Eye Releasing has unleashed a new trailer and artwork for the acclaimed indie anthology 'TALES OF POE'. Since the world premiere at the famous Egyptian Theater in Hollywood, 'TALES OF POE' has been met with acclaim and awards on the festival circuit. San Francisco Weekly called the anthology "a worthy successor to the Roger Corman/ Vincent Price Poe films" while Icons of Fright hailed the result as "downright stunning to witness...wickedly adventurous". Co-directed by Bart Mastronardi and Alan Rowe Kelly, Tales of Poe combines the classic horror prose with the star power of legendary scream queens Adrienne King (Friday the 13th, Friday the 13th Part 2), Caroline Williams (Texas Chainsaw Massacre 2, Halloween 2), Amy Steel (Friday the 13th Part 2, April Fool's Day) Debbie Rochon (Model Hunger, Hell Town) and Lesleh Donaldson (Happy Birthday to Me, Funeral Home). Wild Eye plans to release 'TALES OF POE' on DVD and Digital HD in October. "A loving tribute to the work of one of history's greatest horror writers." Based on the timeless works of Edgar Allan Poe, three of the renowned author's most popular stories (The Tell Tale Heart, The Cask of Amontillado, and Dreams) receive unique retellings by directors Bart Mastronardi & Alan Rowe Kelly. Offering a compelling and shocking journey into madness and the macabre, Tales of Poe features some of the most beloved final girls in horror movie history in new and exciting roles.